Apple’s AirPort Utility for iOS includes a Wi-Fi scanner you can use to scan for nearby networks from your iPhone or iPad. 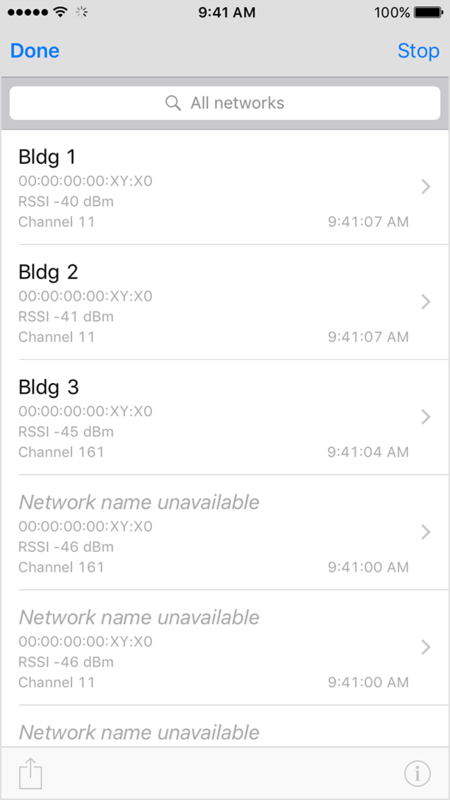 Scan results are presented as a list and include only a few fields to describe the networks found: BSSID, SSID, channel, RSSI, and time. Rather than examining the scan results in the app itself, you can visualize them in WiFi Explorer Pro (1.3 or higher) with a simple copy and paste. 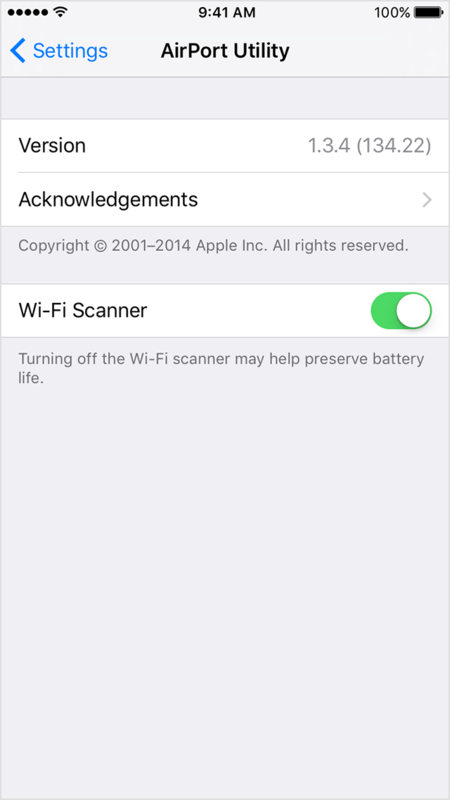 To scan for networks using AirPort Utility, on your iOS device, go to Settings > AirPort Utility to turn on the Wi-Fi scanner. Next, open Airport Utility and tap Wi-Fi Scan. To start the scan, tap Scan. 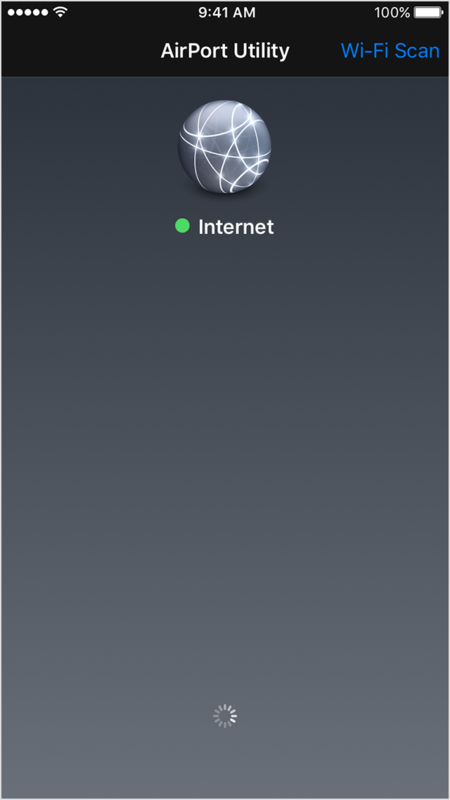 AirPort Utility scans all available bands at four-second intervals and will continue scanning until you tap Stop. 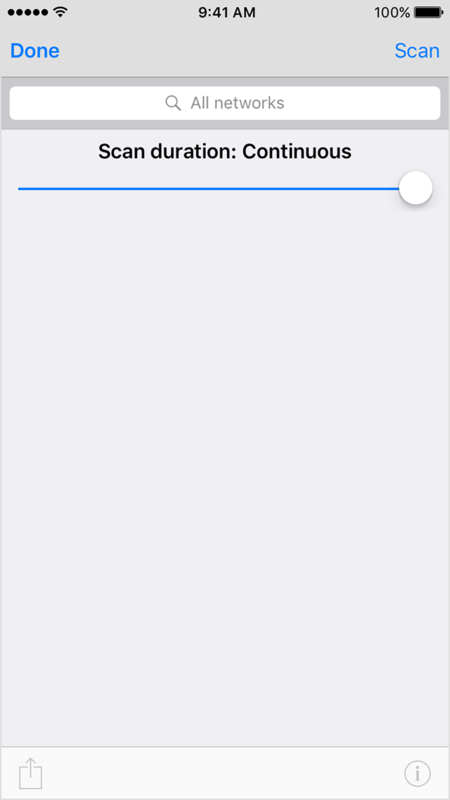 You can also use the slider to set a scan duration of up to 60 seconds. AirPort Utility offers different ways to share the scan results, including AirDrop, Mail, and Copy. You can choose any of them to import the results into WiFi Explorer Pro. If you're running macOS Sierra (10.12) or later and have Handoff enabled, the easiest way to import the scan results from AirPort Utility is by using copy and paste. Just tap the share icon and choose Copy, then switch to WiFi Explorer Pro in your Mac and choose Edit > Paste, or press Cmd+V. Similarly, if you choose to share the scan results by using the Mail option, you can open the email message, copy the content by pressing Cmd+A, Cmd+C and paste it into WiFi Explorer Pro with Cmd+V. Any signatures or footer information found in the text of the email is ignored, so you don't need to worry about that. If you choose AirDrop, simply open or drag & drop the text file into WiFi Explorer Pro. The same can be done if someone sends you a file containing the results. Just make sure the file's name has the .txt or .csv extension. Quick note: When importing the scan results into WiFi Explorer Pro, many of the columns and fields will be blank since the data from the results is very limited and doesn't include all the information that can be normally retrieved from a scan. As for the First Seen, Last Seen and Seen columns, you will notice also that WiFi Explorer Pro shows January 1, 2000 as the date. This is because the time field found in the scan results from AirPort Utility only specifies the time of the day. I hope you find the feature useful. Subscribe for occasional information on product updates, tips and offers. Show others your Wi-Fi geekiness! Looking for the old t-shirt? Click here. Honey, I Shrunk the Beacon Interval! Copyright © 2019 Adrian Granados. All rights reserved. MetaGeek and Wi-Spy are registered trademarks of MetaGeek, LLC. Ekahau and names of all Ekahau trademarked products are trademarks of Ekahau, Inc. in Finland and/or other jurisdictions. RF Explorer is a registered trademark in EU and other countries. Ubertooth One and HackRF One are registered trademarks of Great Scott Gadgets. RapidConnect is a registered trademark of MMB Networks. Other names appearing on this site may be trademarks of their respective owners.